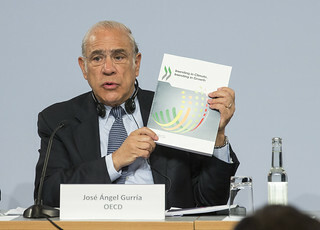 23/05/2017 - Integrating measures to tackle climate change into regular economic policy will have a positive impact on economic growth over the medium and long term, according to a new OECD report prepared in the context of the German Presidency of the G20. Investing in Climate, Investing in Growth shows that bringing together the growth and climate agendas, rather than treating climate as a separate issue, could add 1% to average economic output in G20 countries by 2021 and lift 2050 output by up to 2.8%. If the economic benefits of avoiding climate change impacts such as coastal flooding or storm damage are factored in, the net increase to 2050 GDP would be nearly 5%. The report says G20 countries – which account for 85% of global GDP and 80% of CO2 emissions – should adopt a combination of pro-growth and pro-environment policies in developing their overall growth and development strategies. This means combining climate policies such as carbon pricing with supportive economic policies to drive growth centred on investment in low-emission, climate-resilient infrastructure. Infrastructure investments made over the next 10-15 years will determine whether the 2015 Paris Agreement’s objective to stabilise the global climate can be achieved, and delaying action will end up being more costly. The report shows that taking action only after 2025 would lead to an average output loss for G20 economies of 2% after ten years relative to taking action now. The delay would mean that, eventually, even more stringent climate policies would have to be introduced more urgently, risking greater environmental and economic disruption and leaving more fossil fuel assets as economically unviable. Infrastructure is at the heart of economic growth and yet there has been chronic underinvestment in most G20 countries. Limiting the global temperature rise to below 2 degrees, in line with the Paris Agreement, will require USD 6.9 trillion per year in infrastructure investment between now and 2030, only 10% more than the carbon-intensive alternative. In addition, climate-friendly infrastructure is more energy-efficient and would lead to fossil fuel savings totalling USD 1.7 trillion annually, more than offsetting the incremental cost. Even in countries where the transition to a low-carbon economy will be economically challenging, such as in net fossil-fuel exporters, the right combination of policies can mean that low-carbon growth offsets the cost in terms of the economy and jobs of putting in place mitigation policies. Ensure the integration of climate objectives in pro-growth reforms, in particular to deliver better resource allocation, stronger investment and structural reforms in line with the low-emission transition. Scale up efforts to mobilise private investment in low-emission and climate resilient infrastructure through further efforts to green the finance system. Engage local governments, employers and workforce in the transition of exposed activities and communities, to deliver a just transition for workers.